Some nights, we don't have time to make an elaborate dinner. That's when we decided to try these peanut butter and honey sandwiches! When Daddy isn’t home for dinner, the boys and I cut ourselves a little slack. I don’t make a full meal because, let’s face it, I would only be cooking for myself since the boys often don’t eat what we do. They have to try a bite of whatever I make, but their taste palates aren’t as refined just yet. Last week, when Justin had a meeting to go to in the evening and dinner was up to the boys and me, we decided to try something new. This is another recipe that came from the wonderful little cookbook that Tyler received as a Christmas gift. This was the winner for the night for a few reasons: it was quick, it was easy, we had everything, they could help make it, and I knew they would eat it. 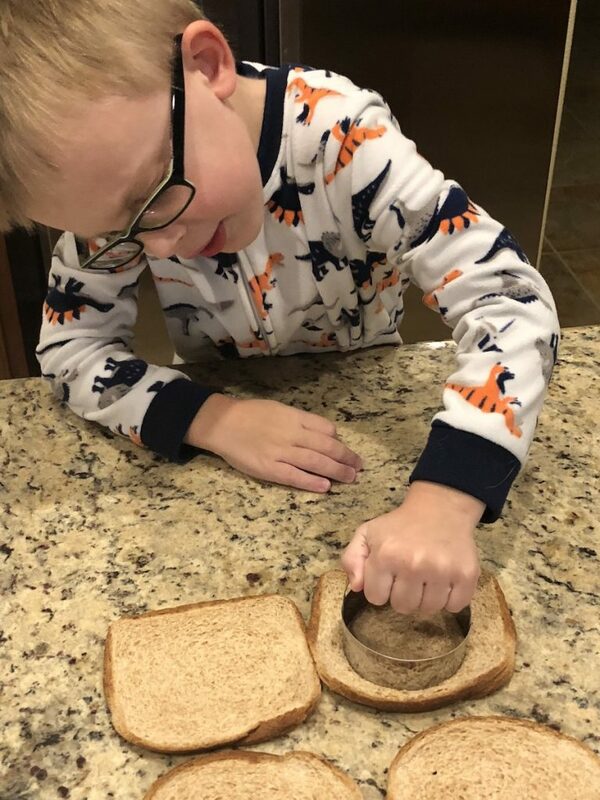 Lately, both Tyler and Ryan have been enjoying a good PB&J sandwich at lunch, so I figured this was similar enough that they would eat it, but also something a little different. 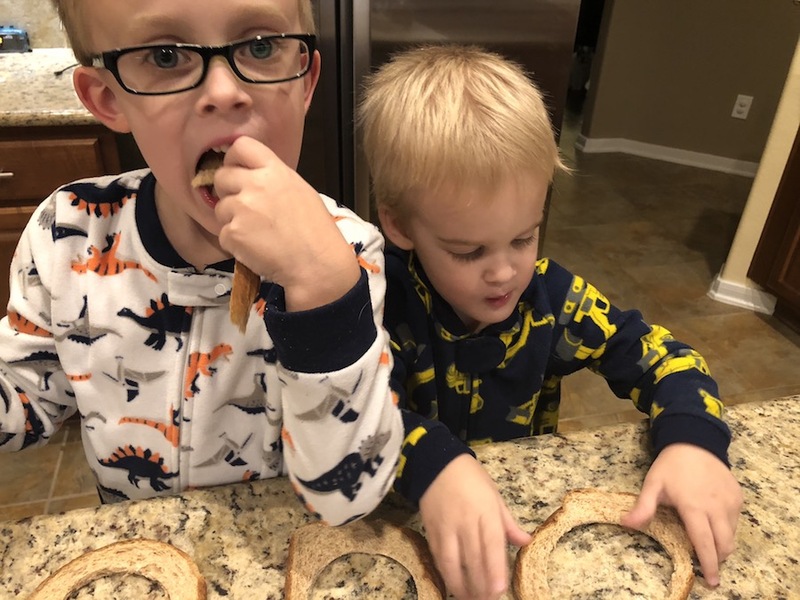 They also like to eat peanut butter on graham crackers with raisins on it, so I know peanut butter is a hit with them (as much as I can’t even stand the smell of it!). We started these by rolling out the bread, so it was thin and flat. The original recipe said to make each sandwich from one piece of bread, but that didn’t seem very practical to me since they would be so small. So we used two slices of bread per sandwich like you would with any other sandwich. Once the bread was rolled out and flat, the boys used my biscuit cutters to cut circles into the bread, making the shape of the sandwich. I wasn’t so sure about this because it seemed like a waste of bread. I was planning to throw those pieces in the compost bin. We also had a great quick conversation about how this is fun and different, but it also would waste the bread, and we are trying hard to cut down on the waste we produce. So Tyler decided that he would go ahead and eat the crust while we were building the sandwiches so it wouldn’t be wasted! They thought it was fun to use the biscuit cutters because it was like making Christmas Cookies! Then the asked if we could make cookies! After they got the circles cut, I spread one side of each sandwich with a small scoop of peanut butter, and the other side with a small amount of honey. Carefully stack the pieces together to form a sandwich. I found it easier to put the piece with peanut butter on top of the piece with honey since I was afraid the honey would run as I tried to flip it over. Use a fork to go around the edges and seal the sandwiches up, and you are done! Tyler and Ryan loved these, and we will definitely be making them again next time I need something quick and easy (and fun) for dinner one night. Some nights, we don’t have time to make an elaborate dinner. That’s when we decided to try these peanut butter and honey sandwiches! This is adorable, and my son may actually eat it! My boys can be picky sometimes and they loved them! Your sons look so focused on the project! That makes it a double win…they’ll eat it AND be involved in taking care of themselves. People often forget about the sense of accomplishment kids get from doing things for themselves. I love peanut butter and honey. My go to meal whenever my hubby was gone was always breakfast fixings, but I like this better because you don’t have to COOK! Great job, mom. Thank you! They have so much fun and don’t realize just how much they are learning when we work in the kitchen together. Meals that are quick and don’t have to be cooked are my favorite for the nights it’s just the boys and me! It is so much fun having little hands helping in the kitchen. I often have my grandkids (especially my grandson) help….he LOVES it. These look like a fun and delicious way to spend a sleepover morning with Gramma. It’s so cute to see how much they love to help! Such a fun way to bond with your kids (and grandkids)! Wonderful you include your children and let them help in the kitchen. I always let my children help in the kitchen and they are wonderful cooks and bakers now. 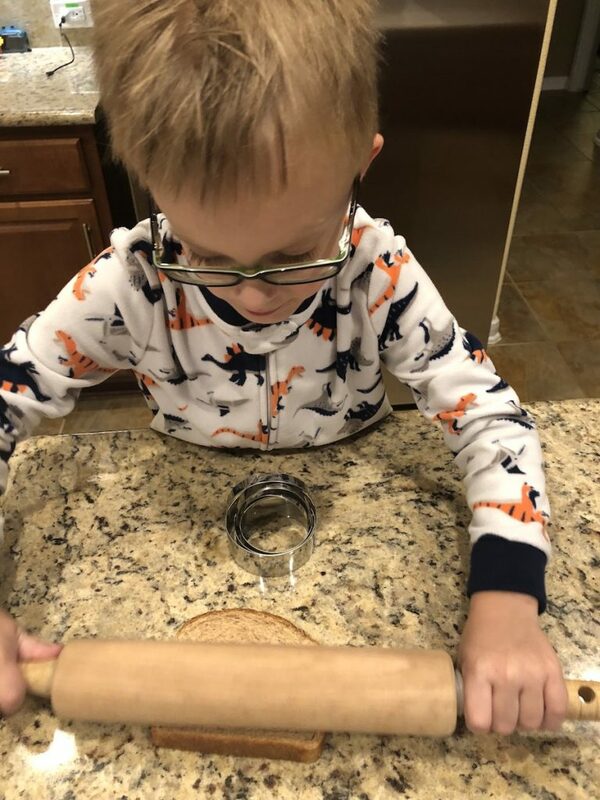 I’m hoping that, by fostering a love for cooking early, they are at least able to maintain a fairly healthy lifestyle as they get older since they’ll know how to cook more than just out of a box. Good job getting the kids involved! I found my kids always ate more if they helped fix the meal. PB&H have been standbys in my kitchen for a long, long time! I agree, they seem to eat better when they feel like they were able to help. This was the first time we have tried this combo and we will definitely be making it again!